We all know the story of the infamous forty-seven rônin and a lot has been written on this topic and so I don´t want to rehash that here. Everything started when Asano Naganori (浅野長矩, 1667-1701), the daimyô of the Akô fief (赤穂藩) of Harima province, attacked and wounded the court official Kira Yoshinaka (吉良義央, 1641-1703) in Edo Castle on the 14th day of the third month Genroku 14 (元禄, 1701). After Naganori was compelled to commit seppuku, his retainers became masterless rônin but planned over two years a revenge which went down in history. This time I want to introduce a tantô ordered by one of the forty-seven rônin only two years before Naganori assaulted Yoshinaga. The rônin in question is Kanzaki Yogorô Noriyasu (神崎与五郎則休, 1666-1703) who was born in Tsuyama as son of Kanzaki Mitsunori (神崎光則, ?-1717) who was a retainer of the Mori family (森), the daimyô of the Tsuyama fief (津山藩) of Mimasaka province. 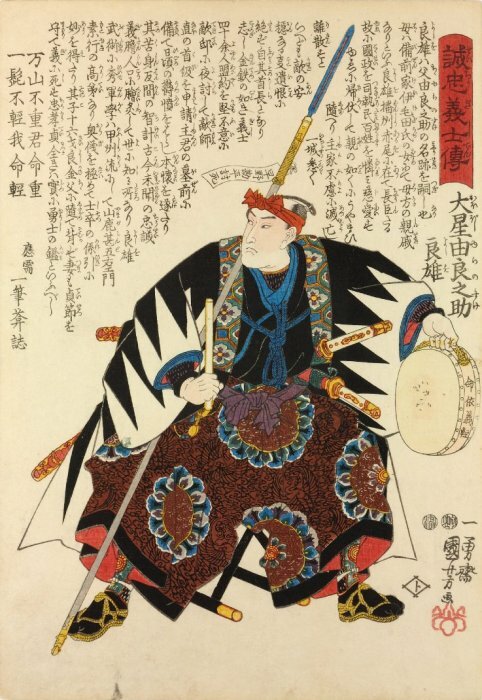 It is not entirely clear how it came that the Kanzaki left Tsuyama and ended up in Akô but what we know is that at the latest by Genroku six (1693), Noriyasu became a reatiner of the Asano, the daimyô of the Akô fief. His annual salary was 5 ryô plus a stipend to support three persons. This was pretty low but as mentioned, his family was not in a hereditary lord-vassal relationship and so he was treated as shinzan (新参, “novice”, “new into service”). But he was known for his refined taste and poetry and was counted with Ôtaka Tadao (大高忠雄, 1672-1703), another one of the forty-seven rônin, and Kaya no Shigezane (萱野重実, 1675-1702) as one of the Three Famous Poets (sanbagarasu, 三羽烏) of the Asano retainers. Apart from that he became a student of the famous Confucian philosopher Ogyû Sorai (荻生徂徠, 1666-1728). 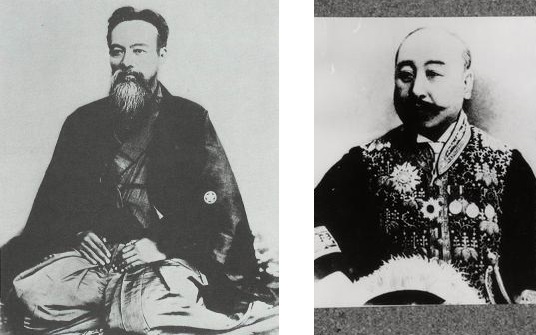 So he eventually managed it to get the post of kachi-metsuke (徒目付), a post responsible among others for taking care that everything goes smooth when the daimyô visits Edo Castle during his sankin-kôtai turn and also doing night watch in the castle. This post earned him additional 5 koku. So this post eventually allowed him to place an order for a fine blade at the local Akô smith Munesada (宗貞). 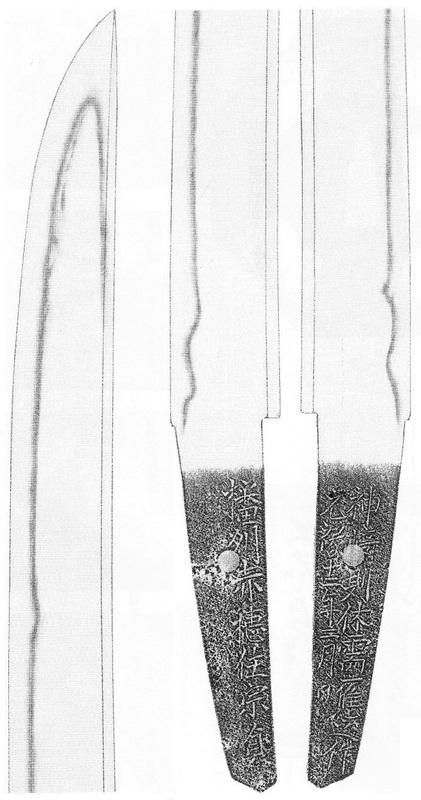 Picture 2 shows the blade in question, as mentioned a tantô, measuring 29.0 cm in nagasa and showing a sori of 0.45 cm. It bears the following signature: “Banshû Akô-jû Munesada – Kanzaki Noriyasu no motome ni ôjite kore o saku – Genroku jûninen nigatsu hi” (播州赤穂住宗貞・神崎則休需應之作・元禄十二年二月日, “made by Munesada from Akô in Harima province on orders of Kanzaki Noriyasu on a day in the second month Genroku twelve ”). So the blade was ordered when everything went just fine in Akô and Noriyasu had enough money at the side to commission Munesada with such a work. And Munesada was no nobody. He had studied under the famous master Tsuda Echizen no Kami Sukehiro (津田越前守助広) in Ôsaka. 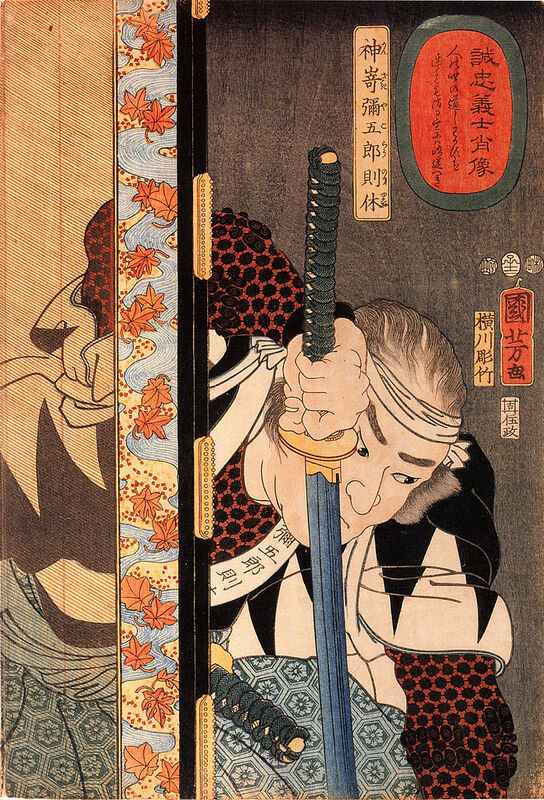 The blade comes in its original chiisagatana-koshirae with a black-lacquered, diagonally ribbed saya, a red-lacquered hilt wrapping on red-lacquered wrinkled shibokawa, and an unsigned iron tsuba in tatemaru-gata showing a matsubishi lozenge design in brass and silver zôgan. But this tantô was not used by Noriyasu at the vendetta in Genroku 15 (1703). At that time records say he wore a katana by Hiromitsu (広光) measuring 2 shaku 5 sun (~ 75.5 cm) and a mumei wakizashi measuring 1 shaku 8 sun (~ 54.5 cm). And while we are on the subject, I want to introduce a tsuba which was supposedly worn by Ôishi Yoshio (大石良雄, 1659-1703), the karô elder of Asano Naganori and the later leader of the forty-seven rônin. It bears the inscription “Ôishi Yoshio kore o mochi” (大石良雄持之, “owned by Ôishi Yoshio”) which was added later via a kiritsuke-mei. It has an uncommon mokkô-gata shape and shows four sukashi framed by gold nunome-zôgan elements in the form of two facing tomoe. Two tomoe were namely the family crest of the Ôishi. 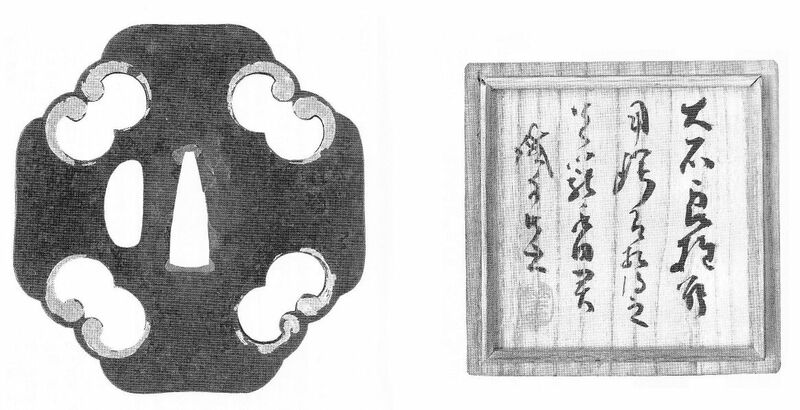 The tsuba is attributed to the early Harima branch of the Umetada school (埋忠). But not less interesting is the hakogaki of its tsuba box. It was namely written by the famous swordsman Yamaoka Tesshû (山岡鉄舟, 1836-1888) and goes: “Ôishi Yoshio shoyô tsuba ari aieru kore Koteda-kimi ni teisuru – Tesshû-koji” (大石良雄所用鍔有相得之呈籠手田君・鉄舟居士, “Acquired this tsuba from the possessions of Ôishi Yoshio and present it to Mr. Koteda – the [Buddhist] layperson Tesshû”). The name Koteda refers to the polititian Koteda Yasusada (籠手田安定, 1840-1899) who was one of the best fencing students of Tesshû.